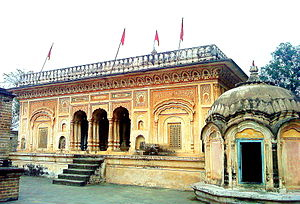 Narbadeshwar Temple is situated in Sujanpur town and was built by Maharani Prasanni Devi, the wife of Raja Sansar Chand. The temple is famed for its rich wall paintings that enhance the beauty of its walls. It is a 200 year old temple that is built in the Bhitti style of architecture. The arches and niches catch the eyes of many visitors in the temple. There are other temples built around the Narbadeshwar, which are dedicated to Durga, Ganesh, Laxmi Naryana and Mahisasur Mardini.